There are those very special days where I just don't want to say anything because Kanye has said it all for me. Today might have been one of them. You know, everything I am not made me everything I am. I thought I'd start exploring my own city before I move to Ethiopia. There is a lot to see in this big city of weirdos. What do you really know about LA? LA: City of Angels. LA: City of hipsters who follow a vegan diet, but occasionally eat meat and keep lots of succulent plants in their house because we are in a serious drought. Lastly, LA: City of Traffic. This is what I learned today. There is no "good time" to get on the 405. I got a henna gig at the library in culver city. High school and middle school kids jumping off walls to get "tatted." Learned that the less options you give people the easier it is for them to choose. Might apply to all things, I will test and update soon. Street art on Crenshaw and 54th. Had to stop for this one. Let's be good to each other. Solid Advice. Someone driving by stopped their car to say, "Don't you just love the palm trees." Yes, we know palm trees aren't native to California but they still look good here. Hills make the most scenic drives. Decided to stop at a lovely overpriced cafe in Hollywood because I couldn't stand to sit in traffic any longer. VERVE COFFEE. The ambience makes up for the price. I am telling you, artists EVERYWHERE, and great ones that is. This is CJ. When I was asking him for advice on painting he said, "people try to paint what they think they see instead of what's really there. Look more closely." 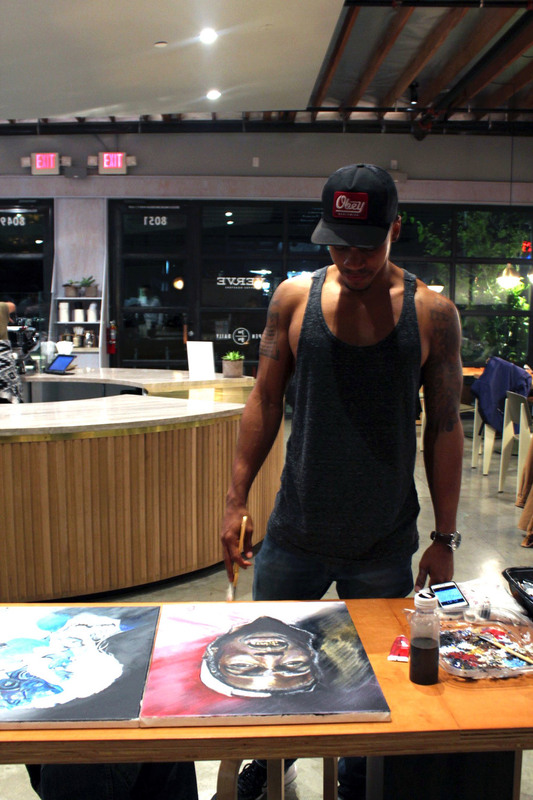 He's currently painting ASAP in a coffee shop. You can't get any more LA than this. You do you. No day is complete without me making a scene.